The descriptions below are of trips that have been successfully offered in the past. Please inquire if you are interested in any of them. 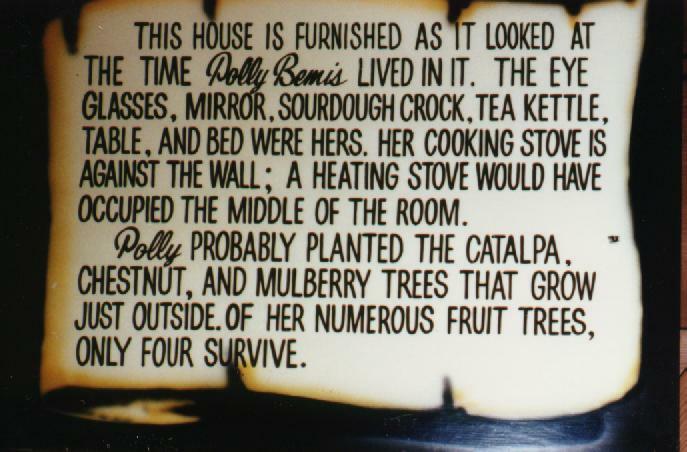 Sign inside Polly Bemis's cabin. Photo by P. Wegars. Brief Description: Idaho's most remarkable pioneer Chinese woman, Polly Bemis, arrived in 1872. Following their 1894 marriage, she and Charlie Bemis took up a mining claim, not a homestead, on the remote Salmon River. Their first cabin burned in 1922, and Charlie died shortly afterwards. Polly's neighbors built another cabin for her, where she lived until just before her death in 1933. It is now on the National Register of Historic Places. 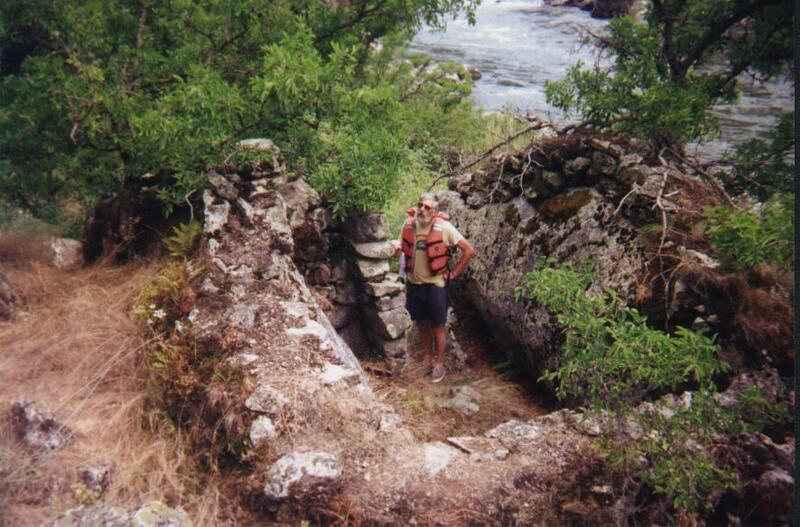 During this three-day, two-night adventure into rugged north central Idaho we visited Polly Bemis's cabin and grave, and Charlie Bemis's grave on the main Salmon River, today easily accessible only by jet boat. We also visited Lewiston's Beuk Aie Temple, now restored and on permanent exhibit at the Lewis-Clark Center for Arts & History in Lewiston, as well as The Historical Museum at St. Gertrude in Cottonwood, where some of Polly's personal possessions are housed. A detailed itinerary from a previous trip may be viewed here. Lower Salmon River. Photo by P. Wegars. Trip Description: Chinese miners first arrived in north central Idaho in the 1860s to work in the newly-discovered gold fields, some of which were on the remote, roadless, lower Salmon River. Today, many signs of their presence can still be seen, including some striking remains of rock dwellings. During this three-day, two-night float trip and rafting adventure, a brief layover at Packers Creek enabled us to examine Chinese miners' rock dwellings, hydraulic workings, man-made reservoirs, and Chinese artifacts. We also visited other Chinese sites along this 55-mile stretch of the Salmon and Snake rivers. Participants also sampled Chinese culture and cuisine, tried their luck at gold panning and Chinese games, and learned to identify Chinese artifacts. Trip Description: This two day, one night adventure into northeastern Oregon featured visits to Baker City's Chinese cemetery and to the world-renowned Kam Wah Chung and Company Museum in John Day, now an Oregon State Park. Its isolated location has helped preserve this fully-furnished store and herbal medicine shop dating to the late nineteenth and early twentieth centuries. We also explored two unique archaeological sites created by mid- to late nineteenth-century Chinese placer miners. One, called the Ah Hee Diggings (earlier known as the "Chinese Walls"), comprises some 16 acres of hand-stacked, wall-like, rock tailings. The other, at Union Creek, has an impressive three-tiered, rock-walled, water delivery channel, originally fed by two earthen dams.